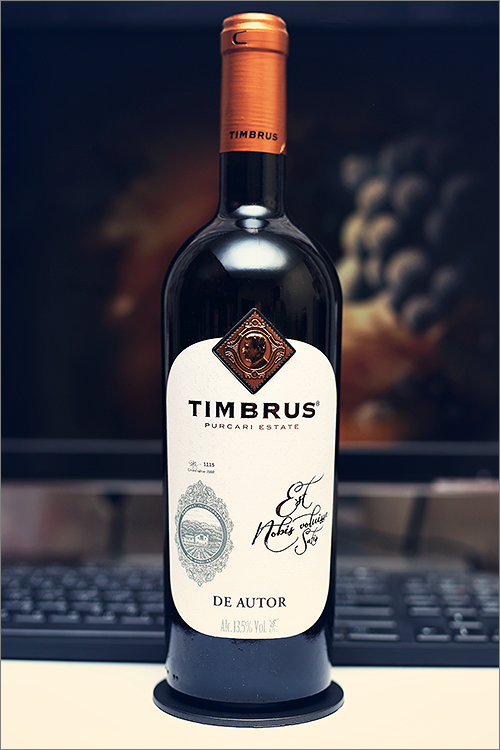 Tonight we are going to review a wine, blended from quite some interesting grape varieties: saperavi – an indigenous variety from Georgia, an international variety – merlot and feteasca neagra – an indigenous Romanian variety and all of them blended under a Wine of Moldova label – Timbrus De Autor 2014 from Bravo Wine. It is produced in a limited, designer edition as the signature wine of the famous spanish winemaker Manuel Vicente Ortiz Martinez. But enough theory, let’s move on to the tasting. Deep and noble garnet color, with shades of ripe sour cherry towards the rim. The nose is strong, filled mostly with black fruits flavours: sour cherry, black cherry, black currant, black plum, black mulberry, blackberry and some hints of black mulberry jam. An instant later comes secondary and tertiary notes of red and black pepper, nutmeg, allspice, roasted oakwood, tobacco and some hints of chocolate. The wine is dry, with strong alcohol level, high acidity and ripe tannin. It tastes spicy, extracted and woody, with a nuanced fruit-forward profile and a quite bold body. This is new world type of wine – crisp, bitter-seedy and complex. The wine has a fair overall balance between fruit and barrique and a quite nuanced fruity accent. It has a medium finish and a balanced, bitter-sweet aftertaste. Conclusion: this is a wine that is not yet on its peak, but it one can definitely drink it it now, still, we believe it requires at least a couple more years of bottle ageing to reach top form. Due to its woody-spicy accents, we would recommend to pair this wine with moderately spiced (think nutmeg instead of pepper), high-protein dishes dressed in sweet wine sauce (honey based dressing will do just fine), as it will form an excellent complementary pairing between wine and food. Enjoy.